Pepper & Chocolate: Côte-d'Or 86% Noir brut - A dark chocolate for the rest of us. 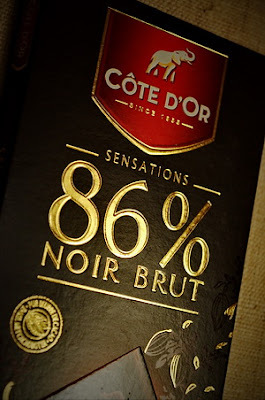 Côte-d'Or 86% Noir brut - A dark chocolate for the rest of us. Following our review' of the Michel Cluizel 99% Noir Infini chocolate and it's little cousin the 85 % from the same maker, we are tasting today the Côte-d'Or 86% Noir Brut. While the Michel Cluizel were mad in France, this Côte-d'Or comes directly from Belgium. You might expect something similar to the Cluizel 85% but it's a completely different chocolate. To put it simply, this chocolate smells good. The rich cocoa aroma is just incredible. On the tongue, it's a lot creamier and smooth than the Michel Cluizel, more like a candy type chocolate. Even though the cocoa content is higher and flavor is rich, it does not have that exclusive and almost arrogant grainy aspect of the French 85% I almost want to call it "a 86% for the rest of us". Many people don't like dark chocolate but this one has a very affordable behavior on the palate. Just like all the other chocolate reviewed here, it does not contain vegetable oil, only 14% of sugar and a lot of cocoa. Long story short, the Côte-d'Or 86% Noir Brut is in the very dark chocolate but make the transition to the darker side. I highly recommend it, they when you like it, try something maybe a little bit more exclusive.